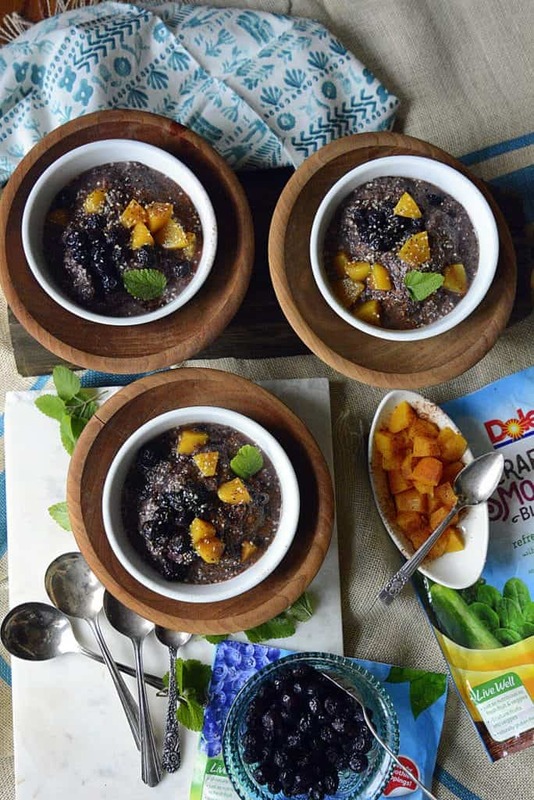 Thanks to Dole Packaged Foods for partnering with me for this green energy smoothie bowl! I am the creator of this recipe and for the description and information that follows. For a full disclosure, click here! I cannot tell you how much I love love Dole’s new Crafted Smoothie Blends! Why do I love them? They’re four versions of fruit, veggie and herb mixes. And, some with spices! They’re packaged in convenient 8 ounce packages. They are guaranteed to be fresh frozen fruit, and you get large nice chunks. You can create artisan smoothies in no time at all! And, when I make smoothies, I make a lot of it because these smoothies will keep refrigerated for a couple of days. No kidding. I just put them in Ball or Mason jars and in the refrigerator. Now, I KNOW these smoothies are exceptionally delicious and nutritious. Just check out the ingredients. 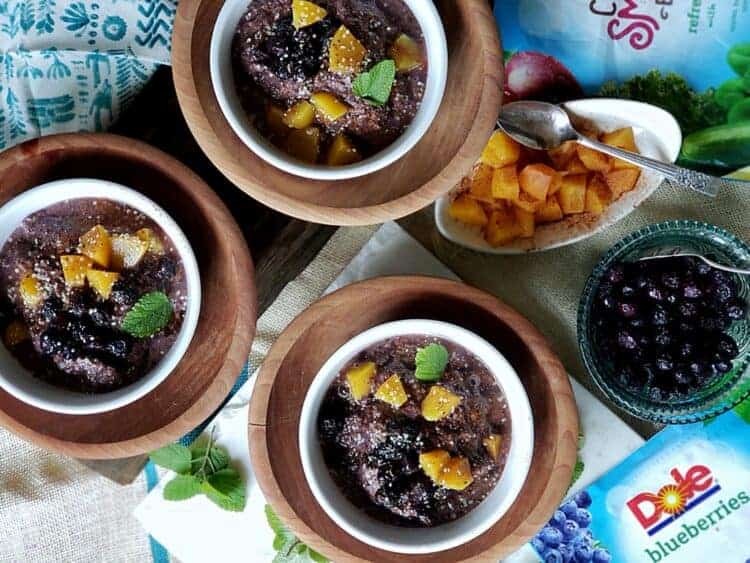 Another way I know is that I’ve taken them to share with my yoga friends after class, sometimes as many as 20 yoginis, all standing around sipping refreshing smoothies after a good workout. And, I recently took a large batch to my physical therapy. Yep, got a bum shoulder and am doing PT for it, so I thought why wouldn’t everyone there love a little ‘Ally Love’ that could do nothing but perk up their healing process! And, I was right! From folks who were nearly octogenarians to Millennials, all of there for one reason or another, loved a sip of a healthy refreshing smoothie. Chill the serving bowls in the freezer about 30-60 minutes before serving. Put the smoothie blend refreshing greens, one and one-half cups blueberries, eight peach slices, one half cup peach juice, almond milk, one-fourth cup hemp seeds, maca powder, two teaspoons of cinnamon and salt in a blender (food processor or other appliance to blend). Blend into a creamy mixture. Pour into the chilled bowls. 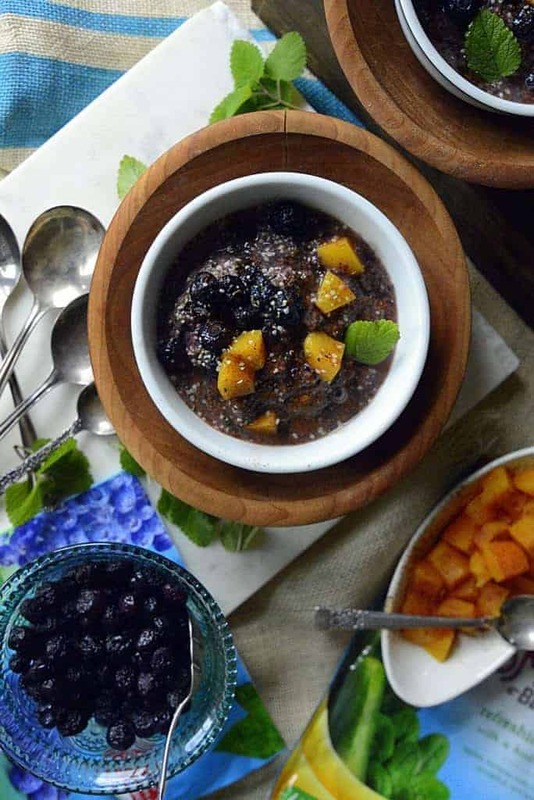 Top with some of the remaining blueberries, peach bites, a sprinkling of more hemp seeds, a dusting of more cinnamon and a drizzle of honey. Serve immediately.